Rina's Rainbow: Short Stories: Figaro Treats with Globe Rewards! 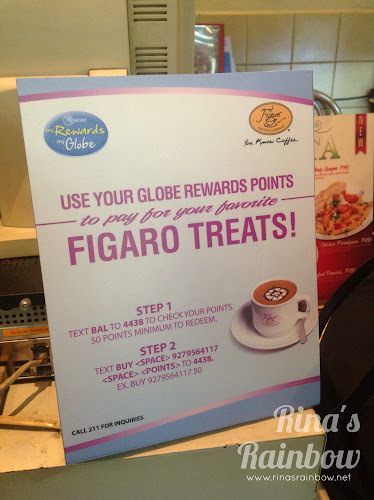 This morning I got a text from Globe Rewards announcing that I can use my points as cash to purchase anything in Figaro Coffee Shop. I checked my rewards balance and saw that it was going to expire on April 15. That's 3 days away! So here I am now at Figaro at The Podium for a dinner with our blogger friends. I'm a bit early so I decided to use my Globe Rewards. You'll see a signage at the counter with instructions on how to claim. The text is sent to the mobile device of the cashier for confirmation. I have 181 points so I got a large Figaro Frost Light Coffee Caramel (P125) and a Vanilla Pudding (P69) Yum! :-) Just had to add P13! Good thing I checked your blog yesterday. 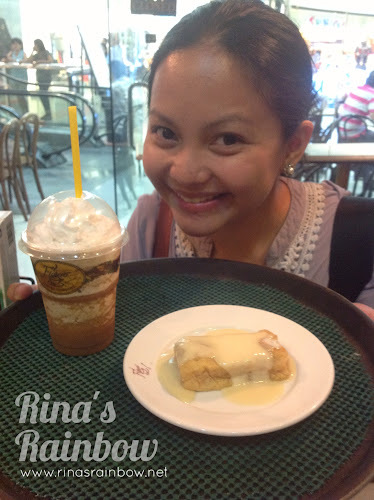 Got to use my points for lunch, adding just Php 42. :) Thanks Rina!